LIMITED & NUMBERED EDITION OF 30 PIECES WORLDWIDE! 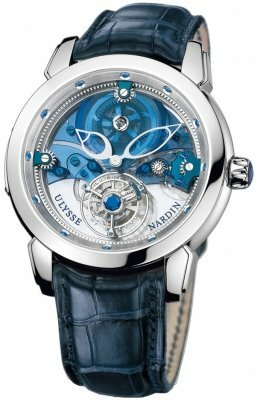 This watch earns it "Royal Blue" name from the blue colored sapphire-crystals used as the mainplate & bridges of the movement. The "Mystery" in the name refers to Tourbillon cage which seemingly floats in place without any frontal support. In addition the 16 jewels are colored blue. Another amazing feat is the seemingly invisible winding system, when winding the watch a mysterious force seems to be setting the cogs & wheels in motion. This is accomplished through a large circular rack hidden beneath the bezel. Solid 950 Platinum case with high polished finish. Unique & recognizable Ulysse Nardin design polished white gold skeleton hour & minute hands. 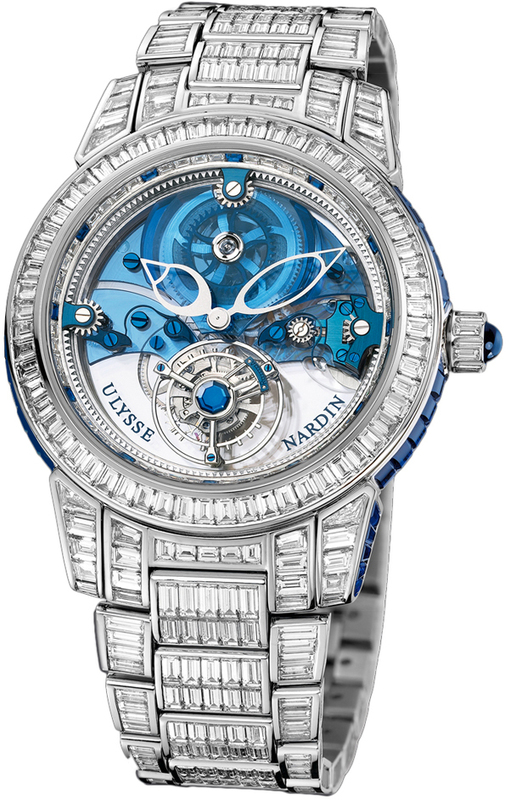 Inner bezel set with 48 baguette diamond minute markers & 12 baguette sapphire 5 minute markers. Bezel & lugs set with 80 baguette shaped diamonds weighing approximately 5.07 carats. Case edge & lug edges set with 45 baguette sapphires weighing approximately 9.20 carats. Solid platinum bracelet set with 432 baguette cut diamonds weighing approximately 27.75 carats & 176 baguette sapphires set on the edge weighing approximately 6.99 carats. 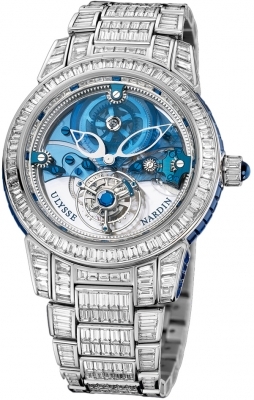 Ulysse Nardin caliber UN-79, beats at 18,000 vph, contains 16 jewels & has an amazing Power Reserve of more than 100 hours.